The polar regions are situated at latitudes beyond which the Earth's angle to the Sun is shallow and the input of thermal radiation is low. During the winter period, the Sun is below the horizon and there are prolonged periods of darkness. The resulting low-temperature regimes dominate ecological processes, either directly by affecting plant growth, microbial activity, animal behavior, organism reproduction and survival, or indirectly by controlling the length of the snow- and ice-free periods in which most primary production and dependent biological activity occurs, the availability of water in liquid form, and the expansion and contraction, and other active layer properties in generally primitive soils underlain by permafrost. Feedback mechanisms from polar regions and their ecological systems to the climate system affect local, regional, and global climate. The balance between greenhouse gas emissions from decomposition, particularly soil micro-bial respiration, and photosynthesis has resulted in a large net accumulation of carbon in arctic soils while ice and snow that cover low, tundra vegetation reflect incoming radiation. Both mechanisms lead to cooling. In contrast, global ocean circulation leads to the redistribution of the Earth heat by cooling the tropics and warming the high latitudes. Both the Arctic and the Antarctic are characterized by vast wilderness areas that are generally young, as most land areas, with some extensive exceptions in the Arctic, were glaciated in the Pleistocene. Polar regions host some of the Earth's most extreme environments and organisms such as snow algae, lichens that inhabit the crevices within crystalline rocks, and the simple communities of soil fauna in the dry valleys of Antarctica. Polar environments vary between the Arctic and the Antarctic and also within each region (Figures 1 and 2). 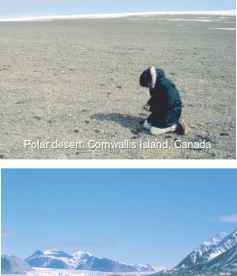 Figure 1 Ecosystems of the Arctic. Figure 2 Coastal ecosystem, sub-Antarctic South Georgia. 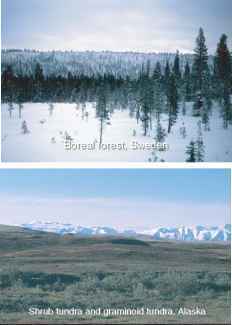 climatic effects of northern ocean currents: in arctic Norway, Sweden, and Finland, forests grow north of the Arctic Circle (66.7° N) because of the warming effect of the northward-flowing Gulf Stream, whereas polar bears and tundra vegetation are found at about 51° N in eastern Canada because of the cooling influence of southward-flowing cold ocean currents. In the Arctic, indigenous and other arctic peoples have been part of the ecosystem for millennia. The large land masses of the Arctic have great connectivity with land masses further south: great rivers flow from low latitudes to the Arctic Ocean, and mammals and hundreds of millions of birds migrate between the summer breeding grounds in the Arctic and overwintering areas in boreal or temperate regions. Food chains in the Arctic are more complex than those in the Antarctic and at the top of the chain are mammalian carnivores such as the polar bears, wolves, and arctic foxes. Population cycles characteristic of arctic animals together with relatively few species in each trophic level can result in ecological instability and ecological cascades: increasing numbers of snow geese in arctic Canada have denuded vegetation resulting in habitat hypersalinity. The Antarctic land mass covers some 12.4 million km2 but less than 1% is seasonally ice free. In the Antarctic, the major environmental variation is associated with the relatively moist and 'warm' maritime climate of the west coast of the Antarctic Peninsula (temperatures are between 0 and 2 °C for 2-4 months in summer) contrasted with the cold, dry polar desert climate of the continental land mass. Consequently, most biological activity and most species are found on the west coast of the Antarctic Peninsula. Vegetation is dominated by relatively simple plant communities of lichens, mosses, and liverworts that support simple soil invertebrate communities. Only two species of higher plant and higher insects occur. Terrestrial mammals are absent and this short trophic structure, together with the isolation of the land mass, has enabled the establishment of a highly specialized, and commonly endemic fauna of ground-nesting birds (e.g., penguins) and seals that depend on the coastal land areas for breeding and moulting, and the sea, for food. 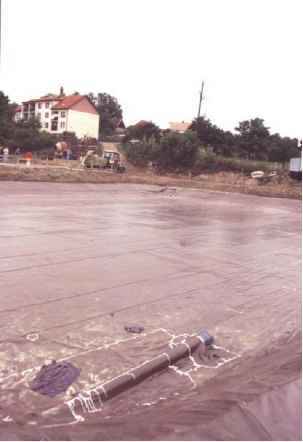 Nutrients for plant growth in these areas are mainly derived from the sea and are deposited on land by wind or birds. 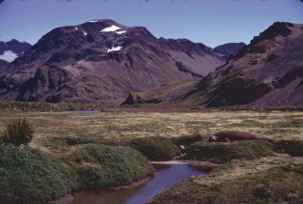 In contrast, over much of the tundra, low nutrient availability to plants limits primary production. There are no indigenous peoples in the Antarctic and human activities there have been restricted to the past 200 years. Human activity has, until recently, influenced both Arctic and Antarctic ecosystems less than most biomes on Earth. However, the polar amplification of global climate change together with the inherent sensitivity of polar ecological systems to invasion by species from warmer latitudes has resulted in the vulnerability of polar ecosystems which are now under threat of rapid change.